NTT Communications Corporation (NTT Com), the ICT solutions and international communications business within the NTT Group (TOKYO:9432), announced today that it will expand the interconnection of its Nexcenter™ data centers in Tokyo and Osaka, Japan to enable client companies to connect with cloud and content services more flexibly than ever before. 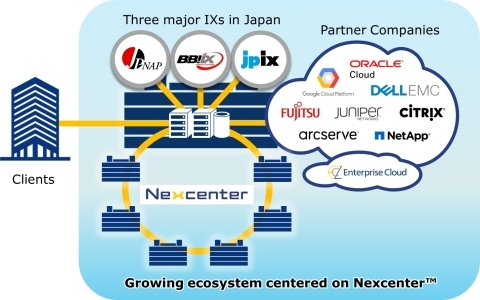 On a sequential basis from this month, NTT Com will begin directly connecting its ecosystem with three major internet exchanges (IXs) in Japan to enable clients to access services offered by these IXs and various NTT Com partner companies. Thereafter, NTT Com will continue to expand this ecosystem centered on NTT Com’s Nexcenter™ data centers. BBIX, Inc.’s IX Connect Service and Japan Internet Exchange Co., Ltd.’s JPIX service, as well as the currently available Internet Multifeed Co.’s JPNAP service, will be interconnected with major data centers that NTT Com operates in Tokyo and Osaka. The IXs will offer an expanding range of services that NTT Com clients will access by connecting to specific data centers via the Nexcenter Connect™ service, which is offered for a flat, low-cost fee.